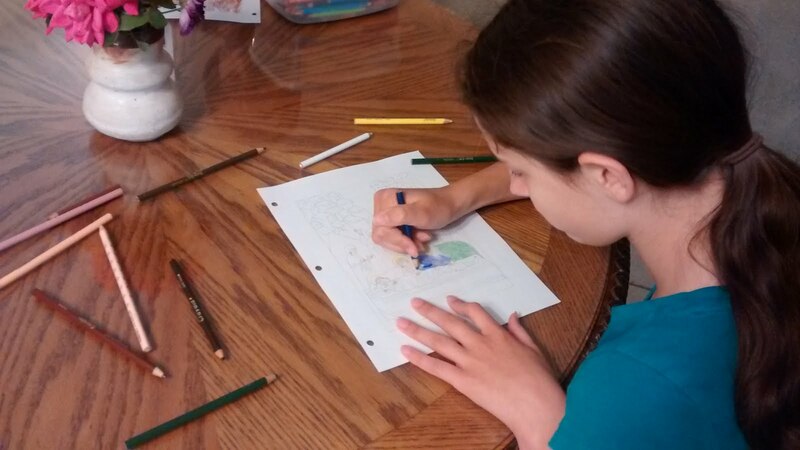 Here is a LINK to coloring pages for your children for Great and Holy Friday. I recommend having them carefully and reverently color the pages while listening to some lovely chant from Holy Friday Lamentations. The beautiful children's book Great and Holy Friday from the Three-Day Pascha series is a wonderful book to read today. Have a blessed Holy Friday! 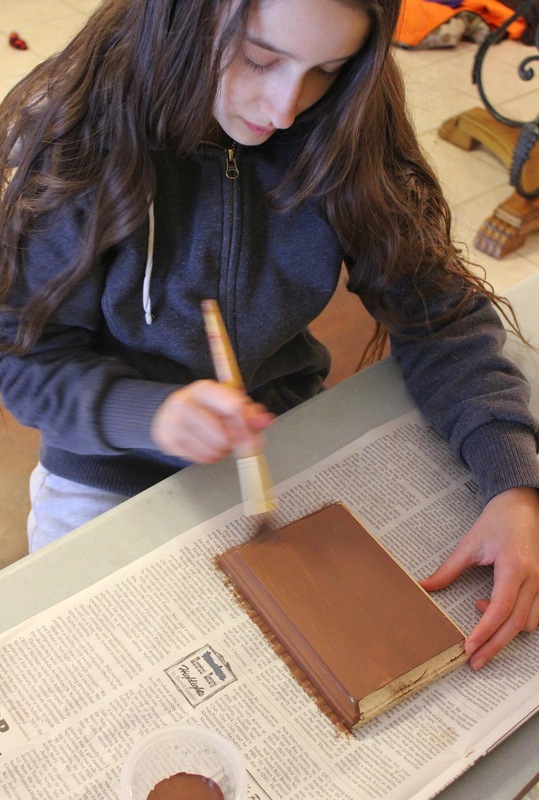 Check out our craft (HERE) from last year for the Fourth Sunday of Lent on St. John Climacus and the Ladder of Divine Ascent. My youngest son's patron saint is St. Patrick so we celebrate his name day today. We read St. Patrick's Breastplate (Lorica), then we had our traditional Colcannon and green frosted cupcakes along with reading this beautiful children's book about St. Patrick. Perfect day for enjoying some Irish music. And my son requested to play lots of games today so that's what we're doing. He even made up a game called "cabbage ball"! 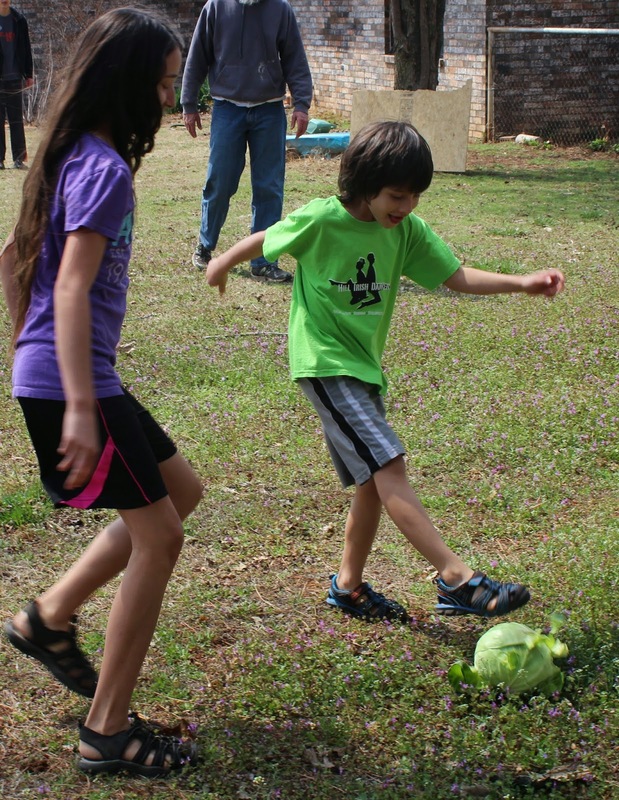 The rules of cabbage ball seem to be somewhat similar to soccer only with a head of cabbage as a ball. Note: be very careful when kicking a head of cabbage. They are hard! We found it best to roll it with the bottom of our feet. The boys won 2 - 1. And our chickens got the remains of the cabbage as a treat! When the potatoes are tender, drain and mash them well. Mix the potatoes, onion, cabbage and carrots together and mash them well. Place the mixture in an oiled or buttered casserole dish. Add margarine or butter, salt and pepper, to taste. This can be made earlier in the day and then re-heated in the oven. The Colcannon is best eaten while listening to the Colcannon song. Erin go Bragh! This year for the Third Sunday in Lent, I decided we would try a masking or stencil-type painting project. I have been working with watercolors lately so I thought a watercolor project would be in order. First we tried the project with a cross cut out of cardstock that we taped to watercolor paper. 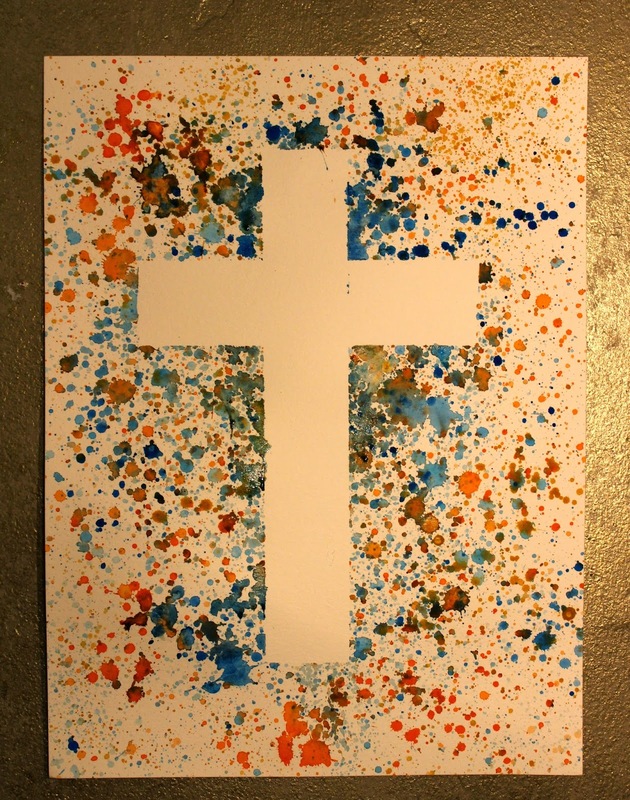 We then splattered several colors of watercolor paint onto the paper around the cross. This was an experimental project for me as I had not tried it before. What we discovered is the watercolors ran a bit under the cardstock cross. Also, lighter colors did not work very well because they did not provide enough contrast. I also tried the project with masking tape in a simple cross pattern. This one came out a bit better as it did not run. 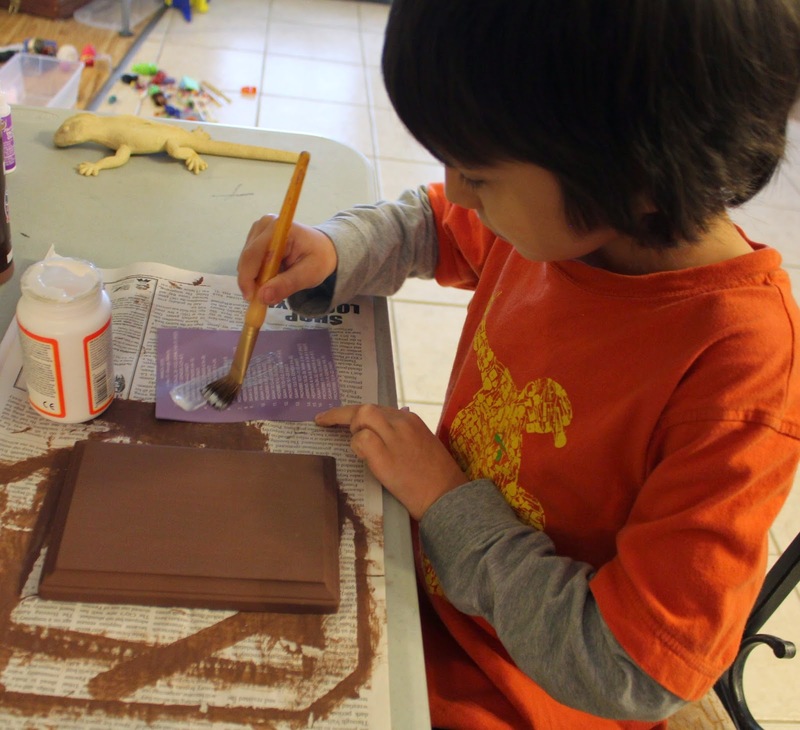 This project would work well with acrylic or tempera paint (just dilute with a little water to make it more runny). I have two sick kids today so just my oldest son and I did the project together. 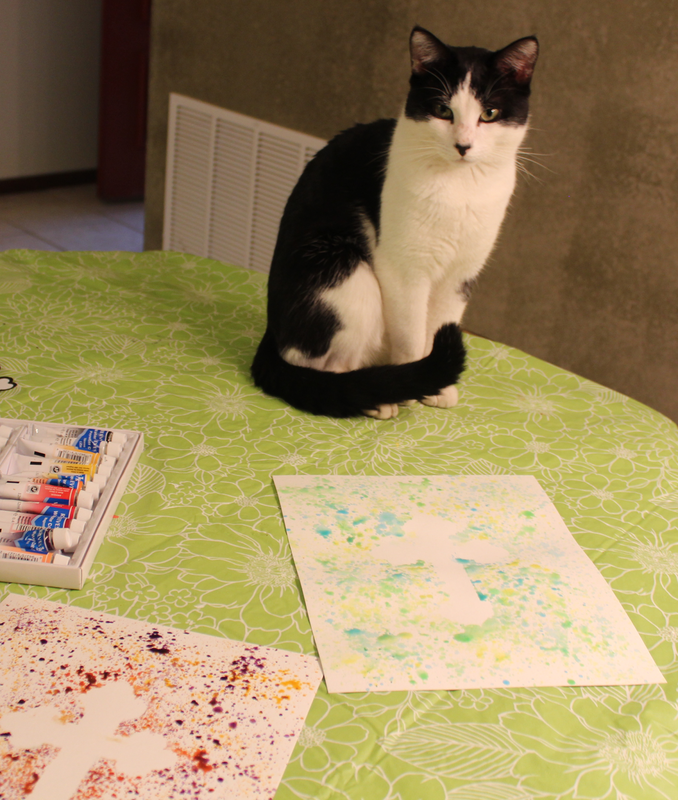 He doesn't usually join me for things like this anymore, but when he was younger we did a craft project together almost every day. So it was nice to do a project together again! Print template of desired shape and cut out. Trace onto cardstock and then cut shape from the cardstock. Place rolled up pieces of tape on the back of the cardstock cross (put plenty of tape on the edges to hold down securely). Or alternatively, place masking tape on the paper in the shape of a cross. Choose at least 3-4 colors of paint and add a bit of water to each color on your palette. Fill brush with paint, hold over the paper with one hand and tap paintbrush with other hand to flick water onto the paper. Make sure to put plenty of color around the edges of the cardstock shape (or tape) for the greatest contrast. Allow to dry a bit before removing the cardstock cross (or if using plain masking tape, allow to dry completely before removing). To see the project we did last year for the Sunday of the Cross click HERE. 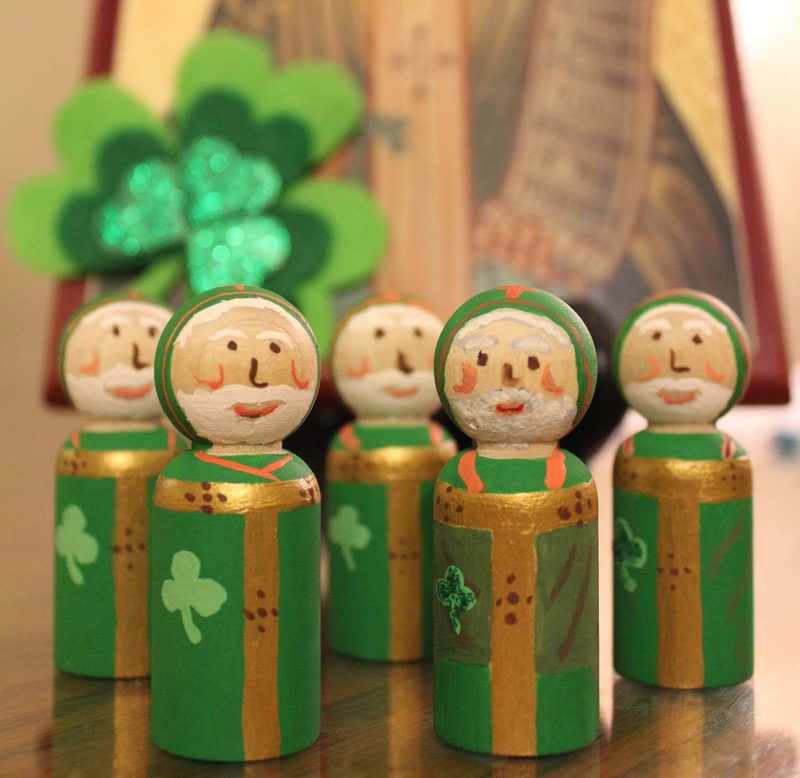 In honor of one of my favorite Saints, my daughter and I made these St. Patrick peg dolls and felt shamrocks. I have a few for sale in my Etsy shop. 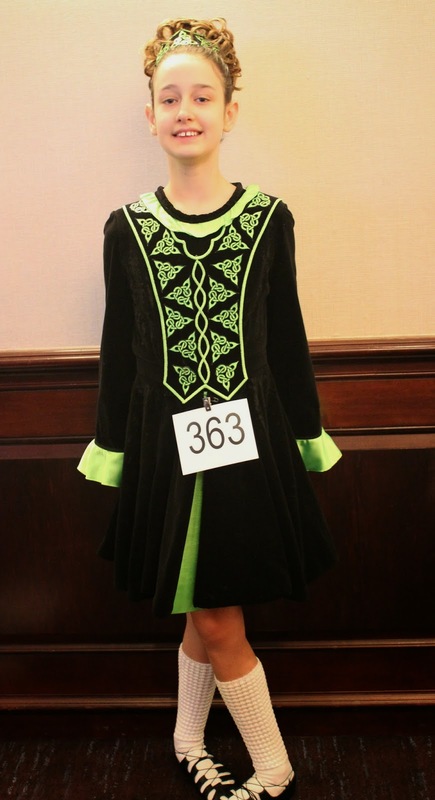 All proceeds go to my Irish dancing daughter as she is raising funds to go to a regional Irish dance competition later this year. She appreciates your support and hopes you enjoy these sweet little dolls! P.S. I highly recommend this book about St. Patrick to read aloud to children. It goes great with the peg doll and shamrock. 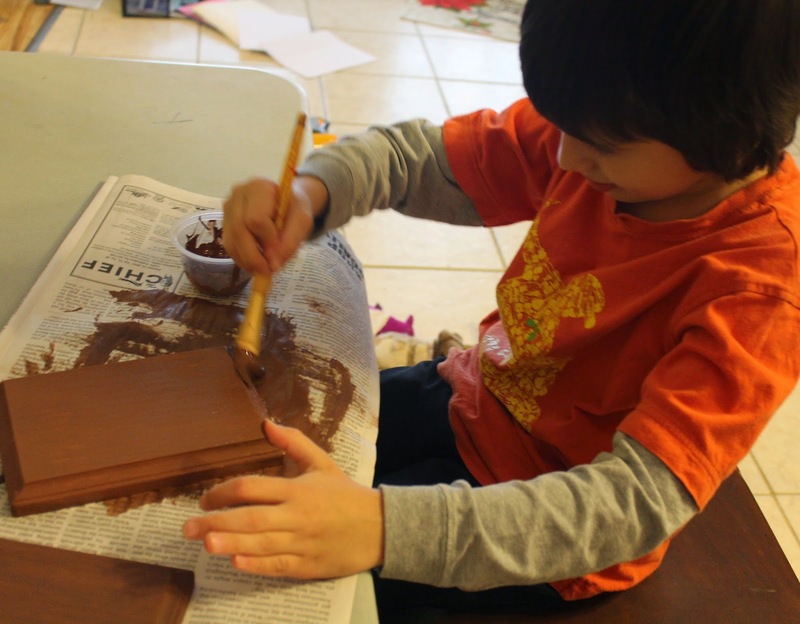 Here is a link to the craft my kids and I did last year for the second Sunday of Lent and the commemoration of St. Gregory Palamas. In preparation for the Sunday of Orthodoxy this weekend (http://antiochian.org/sundayoforthodoxy) I decided a good project for the kids and I would be to mount some icon prints on wood. I had been wanting to try this project for awhile so this seemed like the perfect week for it. This is not an easy project for children so I had them participate as best they could. I had not tried this before so it was a bit of an experiment. I have read about mounting icon prints on wood using varnish, but I decided to try the mod podge method instead. I watched a short tutorial on mounting a photo onto wood with mod podge so I used a similar method for the icons. I learned that the thinner papers wrinkled some with the mod podge. The thicker icon print from St. Elizabeth's did not wrinkle, but I had to be careful when applying the mod podge because if I wiped the mod podge off of the print it smudged off the ink. So I carefully applied a layer of the mod podge to that print taking care not to wipe or smudge it. Since the thinner paper of the magazine and calendar wrinkled some I had to use my fingers to smooth out wrinkles after applying the mod podge. Thankfully the ink did not smudge on these. Overall the project came out decent, but not perfect. First I lightly sanded the wood plaques with fine grain sandpaper (220). Then I had my kids each paint the front of a plaque for their chosen icon print. The store was out of the size of plaque I needed for my daughter's print so we had to use a plaque that was too large. None of the icons fit perfectly onto the wood, but I found wood fairly close in size for the other two. We let the paint dry and then the kids applied a second coat. We used a chocolate brown color. After the fronts had dried, the kids applied one coat of paint to the back. After the plaques were completely dry we applied a light coat of mod podge to the back of the icon prints. It is important to not apply too much mod podge to the back of the paper especially the thinner papers as it will cause it to wrinkle. I laid the print with the mod podge on the back on the plaque and starting smoothing from the middle of the print outward. I had to apply a little extra to the corners as the mod podge dries quickly. 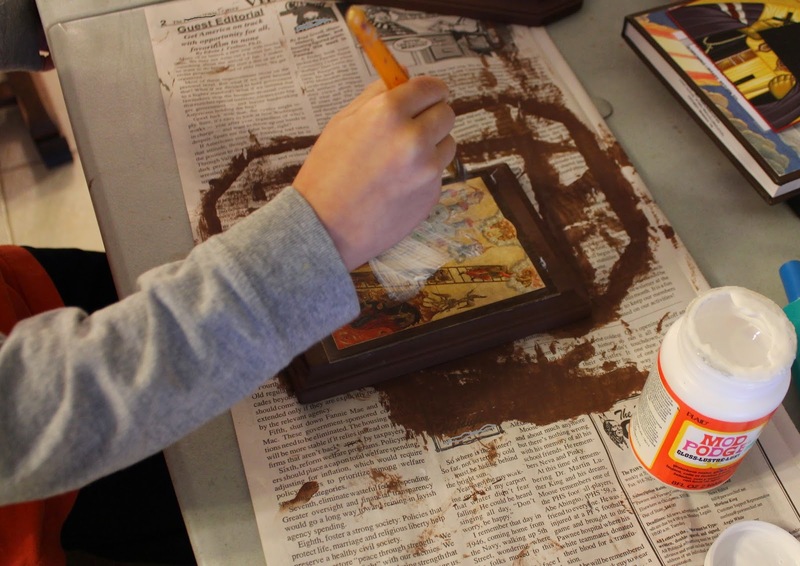 Then I had the kids help apply a thin layer of mod podge over the top of the print and wood. (its best to lay the wood on plastic while you do this step instead of newspaper so the wood does not stick to the paper). I ended up doing most of this step myself when I saw that the thinner paper icons were going to wrinkle. I tried to apply the thinnest coat possible to the thinner papers. Then I smoothed the print out as best as I could with my fingers (I did not do this with the print from St. Elizabeth's which was thicker). Be sure to check a corner of your print to see if the ink is going to rub off before trying to smooth out after applying a layer of mod podge. We only applied one coat of the mod podge and only to the fronts. You can apply to the back also after the front has dried thoroughly, but we skipped that step. After they had dried, the wrinkles were not too apparent. For a first attempt with simple supplies the results were not too bad. 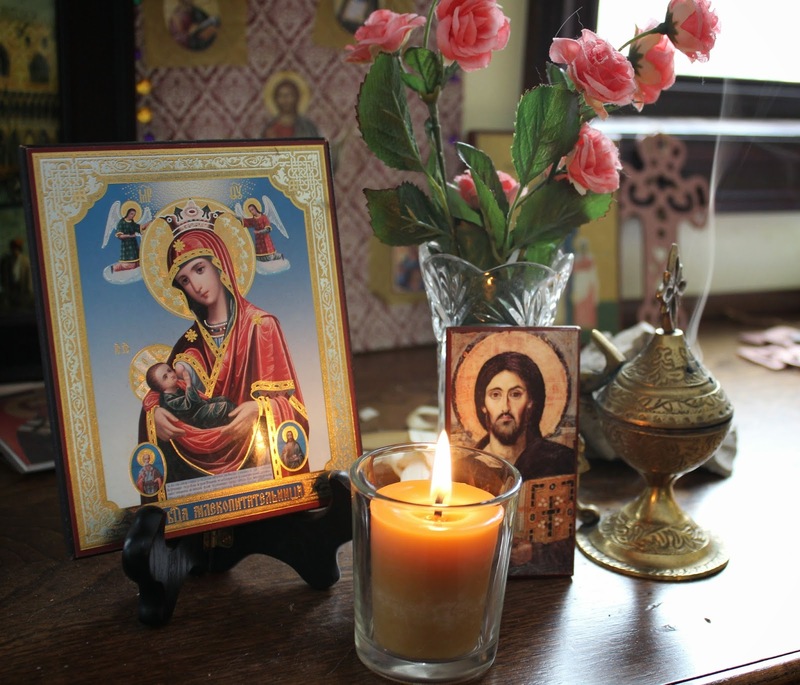 Unfortunately we are snowed in so we weren't able to take our icons to church today for the procession. So we had our own procession at home. From the Antiochian Orthodox Christian Archdiocese website: On the first Sunday in Lent, we commemorate the decision of the Seventh Ecumenical Council in 787 A.D. upholding the use of holy icons in Orthodox worship. We also commemorate today the unity of Orthodox belief and the oneness of our Faith throughout our various jurisdictions, nations and languages and across the continents and the centuries.